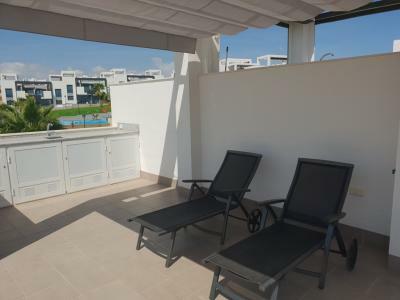 This beautiful penthouse in fase 8 in Punta Prima is equipped with all the comfort you need for a pleasant stay. This property has a spacious living room, 2 bedrooms. 1 x 2 + 2 x 1 sleeps and 2 bathrooms, shower + shower facility. There is a balcony and a spacious roof terrace of 58m2, fully furnished with a outdoor kitchen, table + chairs, a loungset and pergola. From here you will have a nice view towards the sea, the common garden and the swimming pool. The open kitchen is fully furnished, includes a dishwasher. The living room includes air conditioning, hot and cold, SAT TV with international channels and WIFI. The apartment is fully finished with the finest materials and in accordance with the new european standards. The complex is safe and protected and there is an underground parking garage. This is definitely a wonderful place to be and on a very central and lovely location. Ideal for a short stay during your holiday and for long term stay during the winter with the the right facilities and all day sun on the terrace. Also for lovers of golf, it is here an earthly paradise.